Welcome, fellow Hip Homeschool Hoppers. Hey! Thanks for joining in Hip Homeschool Hop. Make sure to check us out on Facebook as well www.facebook.com/hiphomeschoolmoms and on Twitter @hiphmschoolmoms Each Tuesday we will be having a linkup and a giveaway. Cannot wait to get to know you better! 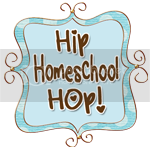 I am stopping by from Hip Homeschool Hop! This is our family's first year homeschooling, so I look very forward to learning from you!